Edith Gladys Wynne (1876-1968) was the fourth surviving daughter (the eldest seems to have died in infancy) of Archdeacon George Wynne and his wife Nell, nee Smith. Nell's father was the Reverend Sidney Smith, D.D., but no relation, as far as I know, to the celebrated wit of that name. Gladys was born while her father was Vicar of Holywood, Count Down, and moved when she was six to Kilarney. You little think what trouble your father has taken that you should be happy and healthy. You little know the pain and the labour which your mother has been glad to suffer that you should be the bright, thriving little thing you are. "I have a headache, Mamma," said Florence, "and I wish you would ask Miss Smith to give me a holiday." "Yes," said her mother at once, "and you may come and lie down here on the sofa near me." But Florence soon made an excuse and went out of the drawing-room to her baby-house, where she played by herself till the others had done their lessons. If you have been to Sunday School and Church in the morning, or have repeated your collect, text or hymn at home, I am sure our Blessed Lord is not displeased to see His little ones play lovingly and gently in the afternoon. He lets the lambs frisk in the meadows every day. And He likes to see you happy. Gladys and Llewy were taught that they were brother and sister to all God's children. When a prettily dressed child of rich parents sees in the park, or in the street, a poor little child begging, or selling matches or violets, in bad thin clothes, she should try help that little girl, because she is a sister - she is one of God's family. When thanks are said after her good dinner, does she close her eyes and join her hands, and say it from her heart, and say 'Amen'; or is she impatient, hardly able to keep still, and pushing her chair away before 'Amen,' to be off to her play again? In fact I know nothing of her life story, beyond the hint that she received a proposal of marriage, turned it down, and regretted having done so. She told me, "A man should always ask a woman again if she refuses him." In those days, the late nineteenth century, it would have been unthinkable for her to have gone back to the young man and told him that she didn't really mean her refusal. In 1891 the Society abandoned its provincial exhibitions and inaugurated an annual Spring Exhibition at the Hall, Molesworth Street, Dublin [until 1975]. The opening speech was not universally approved, being a comparison between watercolours and oil painting, and ending with the words "...than oil painting ever was!" What came before, I don't remember. I remember a holiday with her in Lake Cottage; chiefly I remember sitting on the front doorstep shelling peas! When I was recovering from pneumonia she brought a treasure for me to see, but I can't remember what it was. Cousin May brought a musical box, which I thought was quite wonderful. 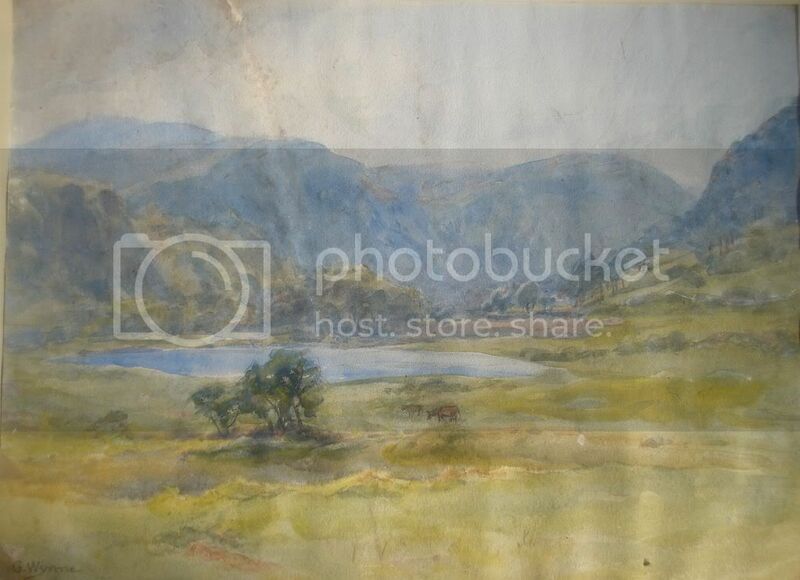 One family anecdote told how Gladys lost her penknife when painting out in Glendalough. A week or so later she took friends for a walk and passed the place. She told them of her loss, and said "I was sitting just here, and put the penknife down here - and here it is!" 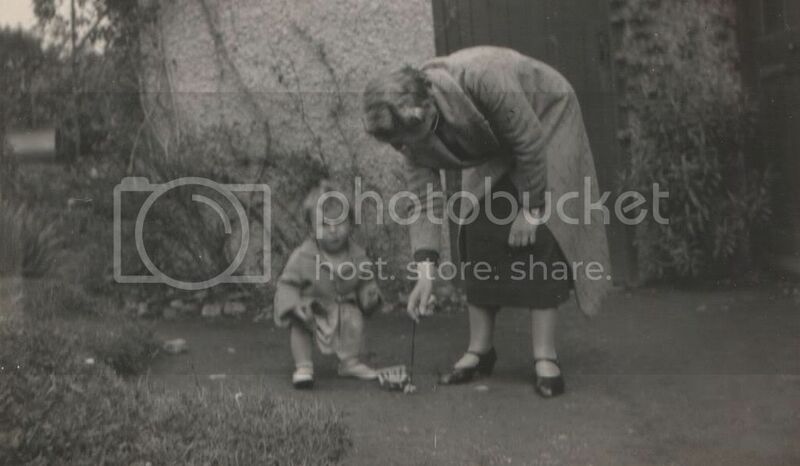 This photo shows Gladys (on the bench, left) in the garden of Alders, Gordon Avenue, Foxrock. This was the home of her aunt by marriage, Evelyn Wynne. Evelyn's sister Irene is sitting on the far end of the bench. .. A painter friend of Stanley's, Carew, often visited us at week-ends. ... it was a coincidence that when we met him again, it was at Glendalough. 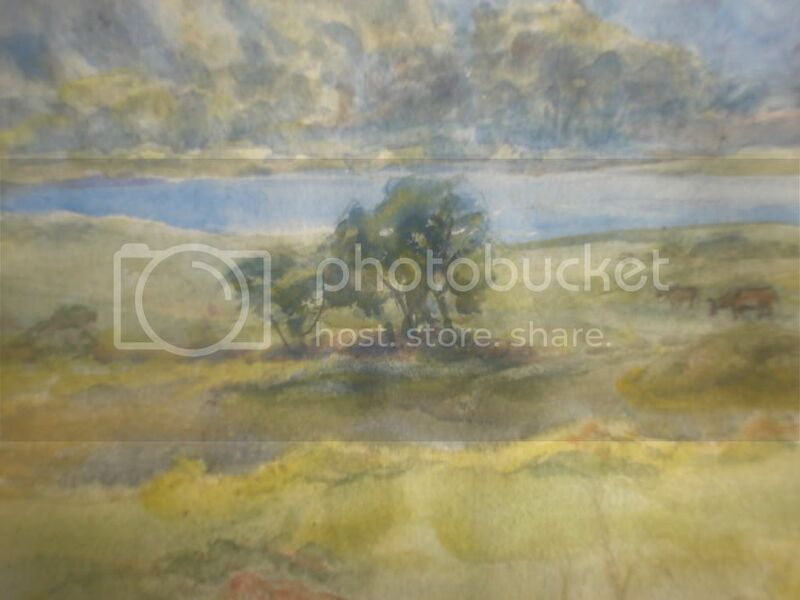 Gladys Wynne, who was a water-colour artist, lived there, as did Jimmy Esmond, and they, with Stanley and Carew, were instrumental in forming an art group. They organised an exhibition of their work in a hall near the Upper Lake and Sean Keating, President of the Royal Hibernian Academy, opened it. In his speech he said, 'My wife likes Glendalough, but I don't. I can't understand why anyone bothers to paint it.' That didn't go down too well with the local people. Her nephew Billy Wynne, who never flinched from speaking seriously to people about the most important matters, spoke to her not long before her death about her faith, and she realised that she was "no better than the next one." She told me that she came to a real faith for the first time then. Billy, when I told him about this after her death, said she came to a greater commitment, but didn't feel she lacked faith before. On the day that Stanley buried Gladys Wynne from Glendalough, a gale tore across the land and hurtled round Derralossary Church. Stanley and she had often gone painting together and once, in Glenmacnass Valley, as they made their way down to the river they had to climb a barbed-wire fence. Gladys' long tweed skirt was caught on the barbs and, legs and grey woollen stockings torn, she had to be extricated. After that her friends told the eighty-five-year old not to join Stanley on his painting expeditions again.On that wild winter's day of her funeral, with the stunted trees in Derralossary graveyard bending to the ground by the force of the gale, at the very moment of committal, the wind whipped the stole from round Stanley's neck and flung it into the open grave. Was Gladys saying a last, mischievous farewell to him? Another very fine Irish woman artist included in the Mealy's sale is landscape painter Gladys Wynne, born in 1876. Daughter of a Church of Ireland rector, she spent much of her life in Co Wicklow, which was a favourite subject for her watercolours. Lot 480 (�400-�600), however, shows the bandstand in St Stephen's Green, Dublin, looking beyond over the trees to the roofline of buildings, including the Shelbourne Hotel. It was such a delight to find unexpected information about Gladys Wynne (Aunt Gladys) a lovely lady whom I was too young to remember as to how she looked except for a vaque impression of lots of soft grey hair in a haphazard bun and long skirts, but I do remember that her spirit as perceived by a small child was one of gentleness and humour. I loved visiting her cottage in Glendalough with my grandmother and grandfather Stella and Geoffrey Wynne who lived in Fan na Greine, a cottage further down the valley. The loveliest memory I have of her is that when I came to visit she used to hang liquorice allsorts from a tree in her garden, and she used to help me pick them. I was utterly convinced that liquorice allsort trees grew naturally and that she was lucky enough to grow the only one in Ireland. It was a magical moment walking past the cottage into what seems to me now as a separated area of the garden and running to the the bright neon sweets hanging from the tree. What kindness that was to prepare such a treat for a little girl. daughter of Ven. G.R. WYNNE D.D. If you own one or more of her pictures and would like to add them to the on-line gallery, please contact david(at)parsonsd.co.uk. Just for fun, there's a fuzzy black and white picture of Gladys with me as a toddler here. 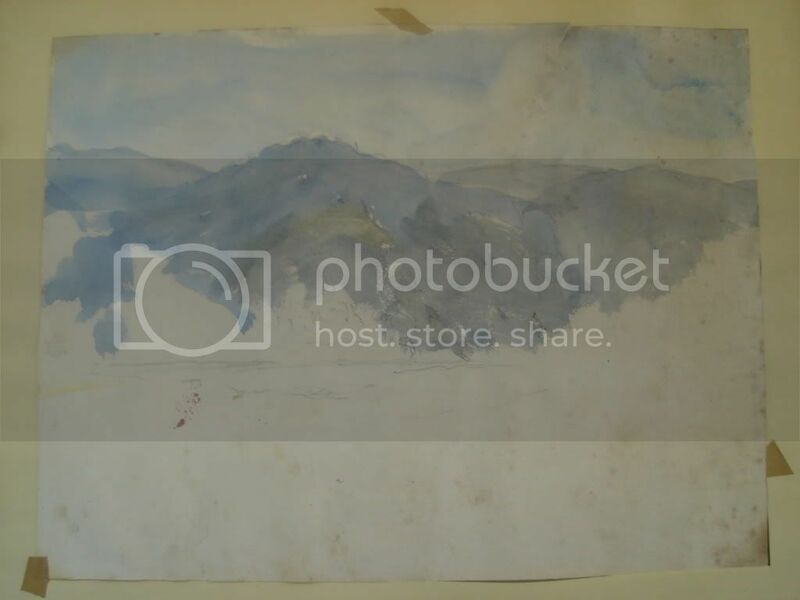 A lst of pictures that have come up at auction.